University Council member Kathryn Burnett. Professor Kathryn Burnett graduated from Queens University of Belfast with a first class honours degree in pharmacy in 1985. Her pharmacy career began in community pharmacy with Boots the Chemists for 6 years, followed by a move into hospital pharmacy in the Northern Health and Social Care Trust for 14 years. During this period Kathryn became mother to her four children and gained her PhD in 2000. Kathryn joined the University as a Senior Lecturer in Pharmacy Practice in 2008, for the new MPharm programme which had just been approved in principle by the registering bodies. 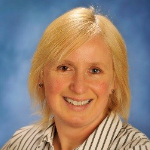 Kathryn has been Course Director of the MPharm programme since, and is the School of Pharmacy and Pharmaceutical Sciences Learning and Teaching Co-ordinator. Kathryn is also the Designated Individual for the Human Tissue Act for the University, responsible for ensuring that all research that involves human tissue complies with the requirements of the Act. Outside of academia, Kathryn is a committee member for the Pharmacy Forum of Northern Ireland, and is Chair of the Pharmacy Forum Education and Research Committee. In her spare time Kathryn is Secretary of the HiElbow Triathlon Club, and enjoys horse-riding in addition to the cycling, running and swimming.